A dozen new police officers will start their public safety careers by patrolling the city’s commercial corridors beginning next week, providing shoppers a sense of security during the holiday season. Police chief Troy Oswald said the dozen officers will be conducting foot patrols in place like downtown Paterson and South Paterson. “You’re going to be on the street walking to show people that it’s safe to come to Paterson, it’s safe to shop in Paterson,” said Oswald. Indeed, the city’s commercial corridors are relatively safe; however, the perception of violence, mostly concentrated in some seedy parts of the city, discourage out-of-town shoppers from venturing into downtown Paterson. After the holiday season, the officers will be moved to regular patrol, said the chief. 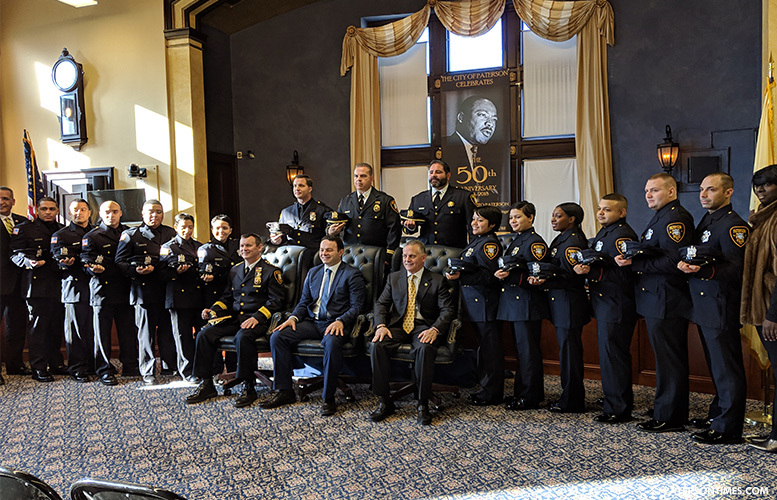 The officers were sworn in in July, just days after the new mayor was sworn in. Police director Jerry Speziale urged the dozen to treat others the way they’d like to be treated. “Remember. Always treatment somebody with compassion,” said Speziale. Oswald reminded the officers to be ethical. “Treat people fairly,” said Oswald. The new officers will start at $34,000 salary and full benefits. Over the years, the officers will climb rank and earn over $100,000, according to police payroll data. “There’s honor in that uniform,” Sayegh told the class inside the City Council chambers on Monday morning.